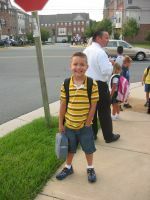 Matthew's first day of school, waiting at the bus stop. I don't know who was more nervous, he or I. After he got on the bus and rode away, I actually got all teary eyed because I was so....I don't know what I was, I just know that I can't believe my small and snuggly baby boy is so big.